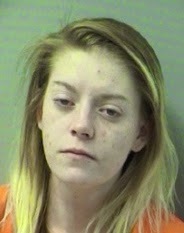 A 20-year-old Pennsylvania woman was arrested for possession of cocaine after being pulled over for a faulty tag light. Niceville Police officers performed the traffic stop on Jan. 31, according to the arrest report. When an officer spoke to the driver, identified as Jesi Lorene Platz, he noticed the smell of marijuana. A search of the vehicle found some marijuana residue on the floorboard areas, the report said. Officers allegedly found a spoon with white residue, a cut straw with white residue, a cellophane wrapper with cocaine and several small clear plastic baggies with cocaine residue in Platz’s purse. A court date is scheduled for March 17.